Roasting marshmallows around the campfire with friends and family is a popular pastime. 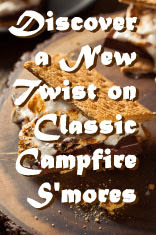 Luckily, the classic combination of chocolate, marshmallow and graham cracker can be enjoyed in so many ways - whether you're fireside or stuck inside! Try giving the sticky-sweet summer favorite a modern twist by using DOVE Dark Chocolate. As the No. 1 solid dark chocolate on the market, the never-bitter, silky-smooth taste of DOVE Dark Chocolate lives up to people's expectations of what chocolate should taste like. Here are two ways to pair everyone's favorite Keebler Original Grahams and DOVE Dark Chocolate to make s'mores-inspired desserts that are impossible to resist. For more information and great DOVE Dark Chocolate recipes, visit https://www.Facebook.com/DoveChocolate. For ease of spreading, each bag of caramel should be melted separately, or else caramel for final layer will be too hard to spread. 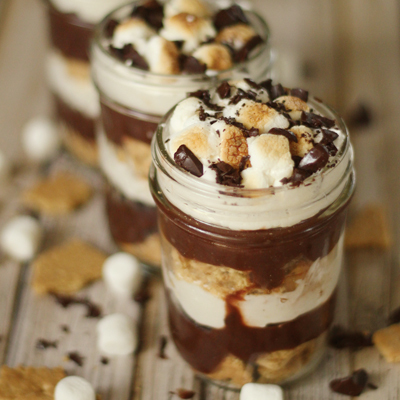 Next, start filling jars by putting 1/2-1 inch layer of broken graham crackers. 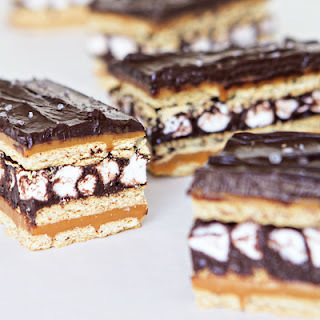 On top of graham crackers, add about 1 tablespoon of chocolate pudding and sprinkle with bit of dark chocolate pieces. Then, add about 1 tablespoon of whipped marshmallow topping mixture. Repeat layers, finally topping jar with toasted marshmallows and another sprinkle of finely chopped chocolate. To toast marshmallows, put mini-marshmallows onto baking sheet (a little stale or cold can help) and put them in oven under broiler for few seconds until golden brown.